This year I have tried, like, a billion planners. I have made my own. I have tried free printables, that are not free because you pay in a way because you receive twenty thousand emails a day. I have tried an academic planner (this has been the best fit for me, actually). And I have tried the Google calendar. All in an attempt to plan the lives of two little boys, Rob, and my blog. I didn’t find the magic planner, though I thought I got quite close with this. However, I think I have found the most brilliant planner ever for next year. 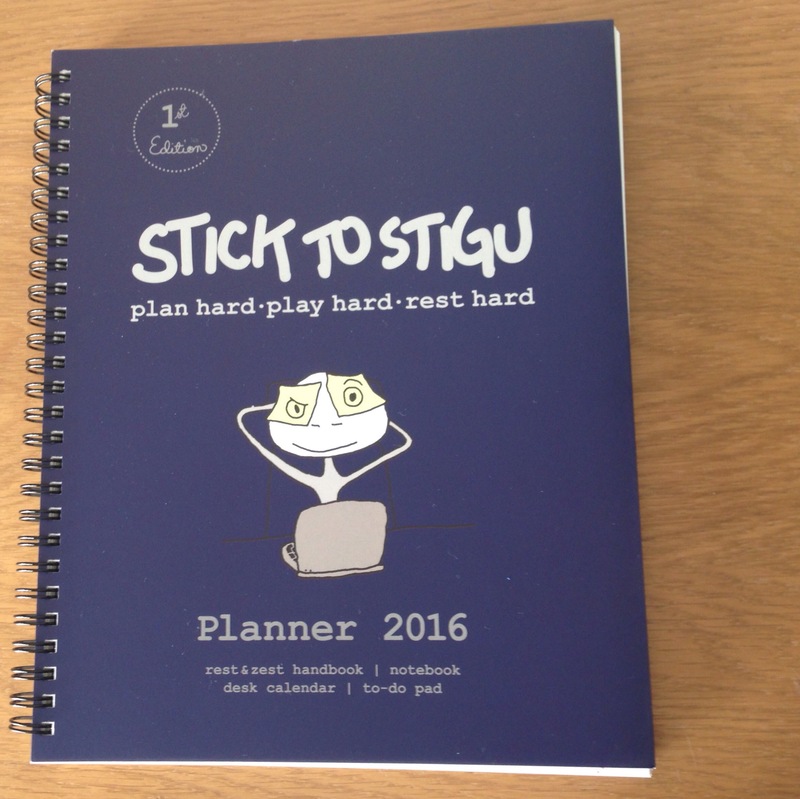 I was sent a brilliant Stick to Stigu 2016 planner, which is calendar, planner and holistic life coach in one. 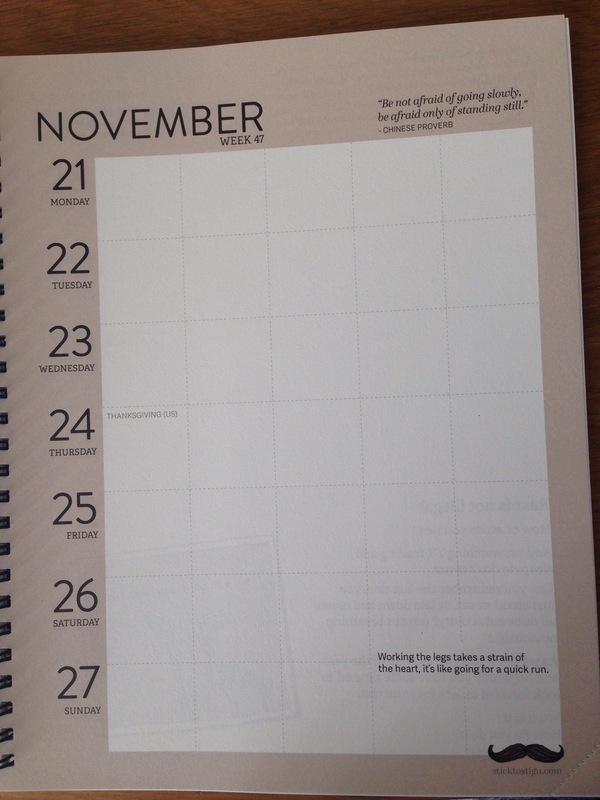 The planner is week to a page, and each day has 5 spaces for you to use however you like. You could put a header on each column and keep track of separate appointments that way – say, daddy’s rota, toddler’s social life, etc. Or you can run a day along the row with perhaps two hours per block. Anyway, the point is that it’s perfectly possible to personalise it, which is ideal when balancing several worlds each day. On the opposite page to each week there’s an almost blank page for notes, doodles, or whatever you like. There are also illustrations of the character Stigu, and very simple instructions on little changes you could make to improve your life; mental or physical well-being, or relationships, among other fun things. I like the feel of the pages; the paper has a nice weight to it, and each page has a little tear-off corner so you can flip the book open to today very easily. The quotes on each page are inspiring and fun. I’m really looking forward to putting this planner to good use. I love that there is a back pocket for loose things to go in, and a big wad of blank pages at the back, too. Stick to Stigu is a new brand, launched just a few months ago and they have a couple of launch offers. The first one is “3 for 2” on the planners, and the other one is “30% off” the planner (when you sign up, no spamming; they promise to only send a newsletter once a month with news, offers, best posts and quotes, etc.). Take a look at their Twitter feed for an idea of their fun illustrations and philosophy. I always struggle with a planner too. I have SO much to plan. I do like the look of this planner but I don’t think it has enough space for me unfortunately 🙁 would make a lovely gift for the right person though? I have an A5 Filofax with a day per page that I use as my diary then I make my own basic blog planners that I print out and slot into my Filofax every week. It’s bigger than a5 and there are loads of blank pages if you needed more space. I think you could still make it work! The motivational quotes and desk exercises are so cute – I love it! Oooh I love a planner, i’m such a stationery geek! We have a family wall calendar where we all have our own column so I can keep across what everyone’s up to which is mega helpful. I haven’t tried a wall planner, mostly because I love pretty books too much!